Pulsar Instruments Plc, announces its Pulsar Nova 45 Class 1 Sound Level Meter has received regulatory type approval from the Physikalisch- Technische Bundesanstalt (PTB) - a highly respected and recognised authority around the world in the verification of correct and reliable measurements. Having passed a series of gruelling tests, the Pulsar Nova was awarded its certificate and now belongs to an exclusive club of just a few meters officially recognised for their high accuracy against international standards. This is a tremendous recognition. Pulsar Nova is the instrument of choice for professionals who are serious about health and safety compliance. 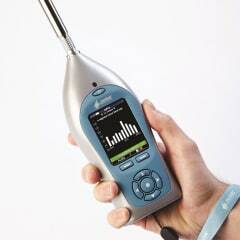 It provides users with all the key parameters required under the legislation for noise at work measurements. The meter is very easy to use and is suitable for basic, and advanced noise surveys, depending on the application, with the option of 1:1 octave band filters, TWA, noise dose and Ln values as well as the calculation and prescription of hearing protection. This PTB approval will be useful to any safety professionals who value precision, reliability and quality when undertaking acoustic testing in the work environment. This will be of particular interest for government agencies and bodies, laboratories or noise consultants who, by law, require type approval such as provided by the PTB to support the accuracy of their noise measurements in complex legal cases. Simon Rehill, General Manager, said: “We are delighted that our Nova has been recognised officially by such a prestigious and respected laboratory such as the German PTB. At a time when the market is awash with so many noise meters, it is reassuring for our customers to know they can find one that has undergone stringent independent laboratory tests, before they embark on any noise monitoring. This will cement the reputation of Pulsar Instruments further as a serious manufacturer with a strong desire to raise the bar in acoustic measurement”.